Thomas J. Campbell is a shareholder with Campbell Knutson. Tom has extensive experience in banking, commercial real estate, commercial leasing, estate and financial planning, and commercial matters. 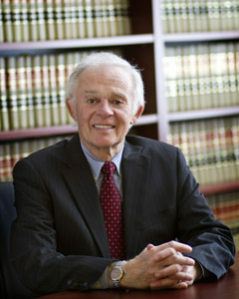 Tom graduated from St. John’s University in 1960, and in 1963 he received his law degree from the University of Minnesota Law School. He has served as a commercial arbitrator for the American Arbitration Association and previously served as Burnsville City Attorney. Tom has lectured to several groups on estate planning matters, including trusts and wills.